Along with the Nova 3i, Huawei also unveils in the Philippines the more premium device under the same series, the Huawei Nova 3. 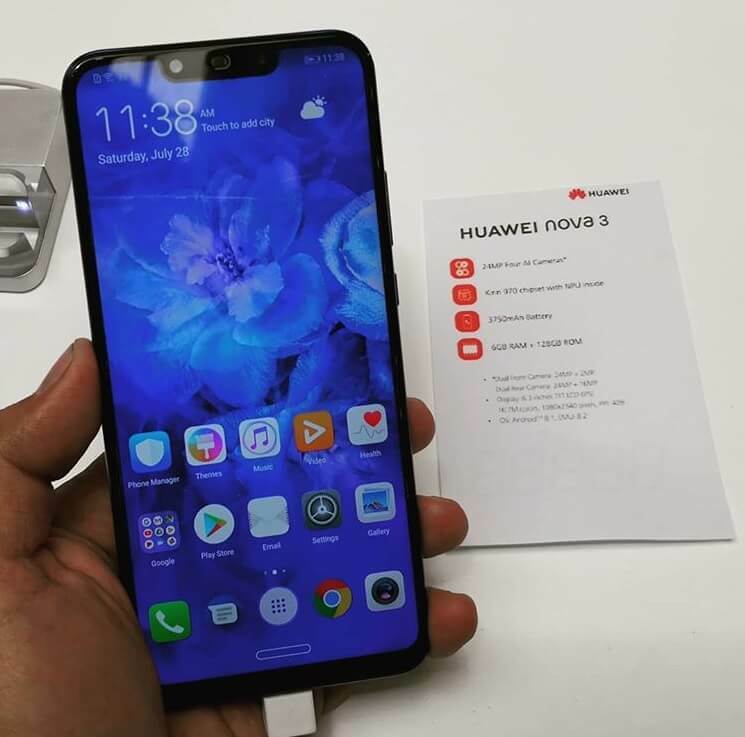 The Huawei Nova 3 looks very similar with its 3i sibling, in fact, they look almost identical and it is really hard to distinguish which is which, especially that they have the same 6.3-inch 19.5:9 FullView FHD+ display. However, their dimensions differ, it is 0.6mm shorter, 1.5mm narrower, and 0.3mm thinner. Moreover, it is 3 grams lighter. But, it is not the physical appearance that makes it interesting, it is what's inside. To begin with, it has HiSilicon top-of-the-line chipset that is the Kirin 970, which is the same processor used in Huawei's flagship devices, namely the P20 series and Mate 10 series. It also has 6GB RAM, which is more than the P20's 4GB, and 3,750mAh battery, which is slightly larger than the latter's 3400mAh. And, even though they have the same storage, the Nova 3 is able to find space for storage expansion. But, it does not stop there, the camera department of Nova 3 uses more megapixels than the P20, albeit without the Leica optics. It has 16MP RGB sensor + 24MP B/W sensor as the main shooters as compared to 12MP RGB + 20MP B/W of the P20. The selfie is even better, it has 24MP + 2MP sensors as opposed to a single 24MP module of the P20. That said, the Nova 3 can be considered as a flagship device with affordable pricing of just Php25,990, and highly recommended alternative to P20. It will be up for pre-order on August 4 to 10, and those who will reserve their unit will get a free Bluetooth speaker when they claim it on August 11.